Soledad Manrique, CONICET researcher. Photo: courtesy researcher. Being a teacher involves taking daily decisions in different situations and complex contexts, something that requires not only theoretical knowledge but also know-how and experience. In order to work on this issue, Maria Soledad Manrique, CONICET assistant researcher at the Mathematical and Experimental Psychology Research Centre (CIPM, UBA-CONICET), has began her study. “The knowledge that teachers acquire during their training is not dissociated from daily practice, but rather about two fields that feed back into each other”, Manrique affirms. Since 2004 she has been working together with an interdisciplinary team on the study of linguistic and cognitive aspects of the literacy process of groups at risk of poverty: illiterate children, young people, adults and ethnic minorities. Currently, she is conducting an investigation whose objective is to contribute to the knowledge of the training processes of kindergarten teachers. “It is essential to work with what lies beneath and supports each teacher’s practice. The theory is precisely used as a tool to observe and understand the daily reality of the classroom due to the fact that their complexity demands different prospect analysis”, she affirms. Between 2009 and 2011, the scientist designed a number of training devices oriented towards the development of child narrative in deprived areas located in Tigre, Buenos Aires, with the objective of studying the change processes that current kindergarten teachers experience during their professional development. Manrique comments that the investigation was undertaken with the participation of 7 “babysitter mothers” – teachers without training-, 19 kindergarten teachers and 6 directors of educational institutions in charge of more than 450 children from 1 to 5 years of age living in poverty. For this research-intervention device, self-observation techniques with videos were used as well as the analysis of each teacher’s practice who participated. The idea was to incorporate theory as a “lens” to observe reading activities and personal accounts. The aim is to promote awareness-raising of the way of working and implement self-observation as an ordinary method. A critical look that triggers different questions such as ‘What is the purpose of this? Who will benefit from this? If the teachers have the opportunity to reflect upon their practice, which is the objective of the device we implemented, they will have the chance to transform their expertise into operational knowledge available for child development”, she comments. During the investigation, the researcher noticed that there are several non-curricular routines in kindergartens such as lunch time. Teachers take advantage of this time and use it as learning space. She explains that although there are no plans that indicate the activities to do when students have lunch or tea, working with language promotes thinking. This indicates that the support for the development of language should be considered as an objective to work transversely with all the activities performed and related to each of the topics of the syllabus. “The transformation of the practice of teaching is first the result of a deeper subjective transformation on the teachers’ part, in their relationship between the tasks performed and their way of observing”, Manrique concludes. Maria Soledad Manrique has begun her research with a doctoral fellowship in 2004 with the analysis of teacher-students interaction in kindergartens of urban deprived areas. With the results of the study, they underlined the role of the teacher as a facilitator of learning opportunities. 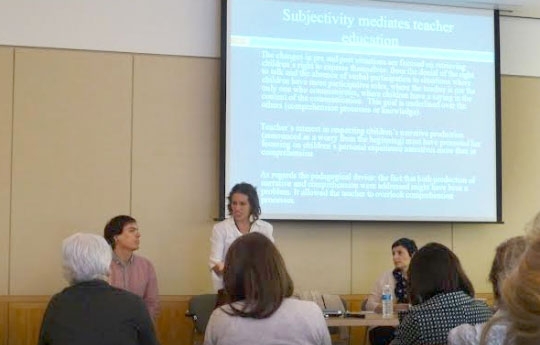 Since 2009, the investigation focused on teacher’s training, especially in the relationship between their mental models, their practices, and the change the guidance of the researchers Ana María Borzone and Marta Souto. Versioning by Cintia B. González. Soledad Manrique. Assistant reseacher. CIPME.